So, you’re thinking of fitting your car with a rad sound system, but playing music at full volume will put a strain on the car battery and cause unwanted havoc to your vehicle. The simplest solution is to purchase a dedicated car audio battery. The best car audio battery gives your sound equipment the right watts and voltage so that they work at their full potential. In short, a dedicated battery will ensure your sound system operates at peak efficiency without affecting any of your car’s functionality. Before choosing a battery, you need to establish the wattage of the entire audio system. The system wattage will have to match the cold cranking amps (CCA) of the battery so that the two sync. A mismatch could result in extra expenses or damage to your system, so it is important you get it right. Now that that’s out of the way, read on to find out about the top available batteries for car audio systems and decide which one would work for you. Absorbed Glass Mat (AGM) technology is used to give the power cell the highest energy density chemistry that results from an acid electrolyte in fiberglass. It has 1000 cranking Amps with a maximum output of 3300 Amps which means that the cell has enough juice to power high performing engines. 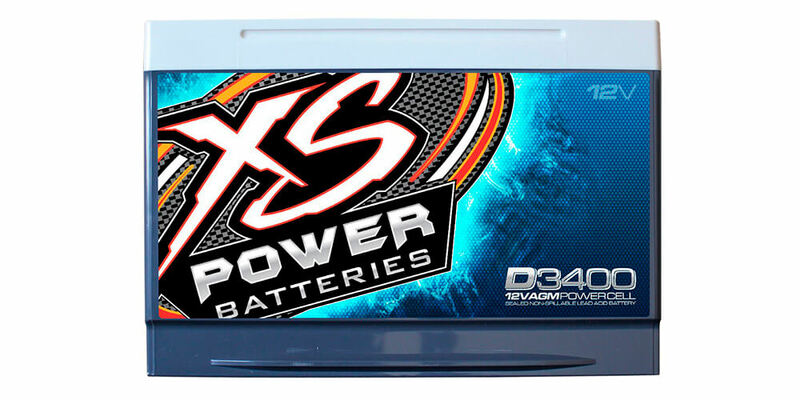 The XS Power’s cell is the best car audio battery for audio systems between 2500 – 3500W. The power cell can either replace your car’s normal battery or as a secondary battery for an aftermarket system inside a car. There are no external vents on the cell, plus its leak-proof design that allows you to mount it in a glove compartment, a trunk or below a seat without any problematic leaks. The XS Power has made a cell that resists extreme heat and vibrations thanks to a reinforced ABS plastic case. This also lets you mount the battery without worries of leaks. The battery has a discharge capacity of 65 amp-hours and actually stores energy so your system doesn’t need a capacitor. Unfortunately, this high-performance cell comes at a high price. In addition, it is heavier than most batteries and so its weight must be taken into consideration. Produces ample electricity for a high-performance audio system. Resists extreme heat and vibrations. Fits in most battery locations. A viable replacement for a standard battery. 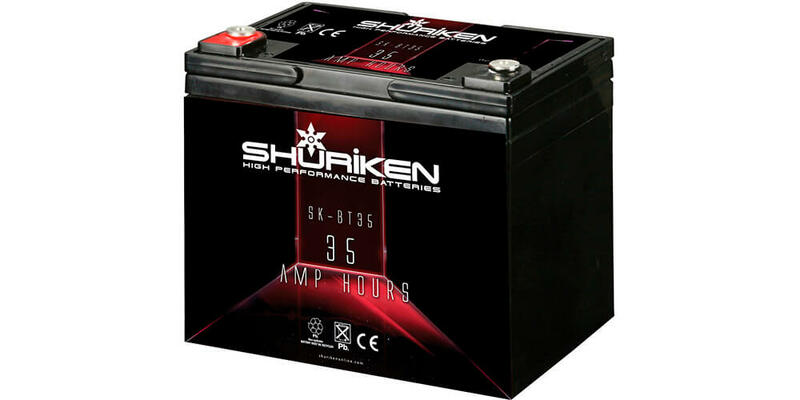 Another power cell using a sealed absorbed glass mat (AGM) design, the SK-BT35 from Shuriken is a high-performance battery best suited for 800-watt car sound systems. AGM technology also makes it easy to mount the battery in any position. Like the XP Power cell, this battery has a unique leak-proof design that prevents hazardous spills. The battery is encased in reinforced ABS plastic and is able to withstand severe heat and vibrations. The SK-BT35 is small and light with a very low ESR and closely packed pure lead plates. Yet you can substitute your normal car battery with it or use it as a secondary battery for a first-class aftermarket system. 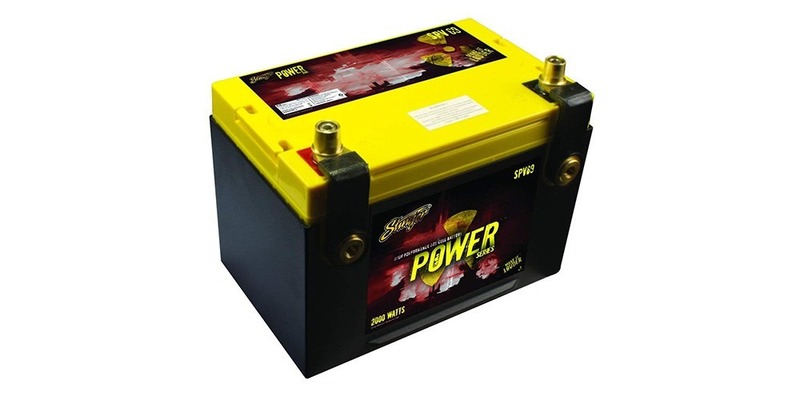 This battery has 950 cranking amps and has a competitive price and is easy to install. Easily mountable in any position. Allows better performance of mobile electronics. Resistant to high heat and intense vibrations. Cannot be used for sound systems more than 800W. Universal’s battery outperforms a lead-acid battery in almost every way. It uses AGM technology to have quicker recharging and overall better performance which minimizes the amount of maintenance needed. It is an excellent choice for deep cycling equipment or any gear that need slow and consistent energy. The UB121000-45978 doesn’t need much maintenance and is essentially “plug and play” with you being able to connect and use it once it’s charged. If you are charging at 10 Amps, you can do a complete charge in 12 hours. It is also a good battery for car audio because of the low monthly self-discharge which means you don’t need to charge it frequently. Additionally, it has a one-year warranty, giving you peace of mind against manufacturing faults. The main issue with this battery is its size. It is both bigger and heavier than most batteries at almost 64 pounds. This does make it tricky to mount it and may not make it your choice battery for car audio. Reliable in extreme heat and vibrations. If you want a battery that is high performance and maintenance free, then look no further. 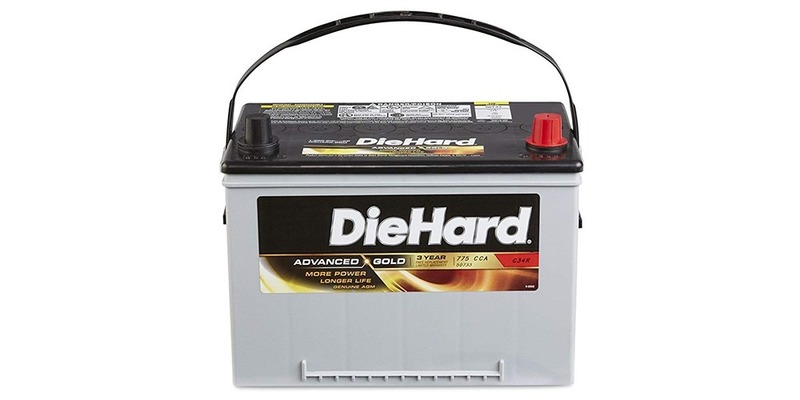 The DieHard 38188 is one of the best car audio battery with 20 times more efficient vibration safeguards that extends its life compared to conventional lead-acid batteries. Following the trend of batteries on this list, the DieHard’s cell is engineered with AGM technology and a spill-proof design to prevent any leakages. This also makes it easy to mount the cell in any position. It is rated at 775 cranking Amps with a 55 amp-hour discharge capacity which allows it to rapidly charge more electronics for an extended time. It is also designed to withstand harsh heat conditions which could degrade the battery. The battery has full-frame terminal plates to minimize electrical shorts and a durable build that is tamper resistant. The terminals wit with most European car brands and fit a lot of American cars too. 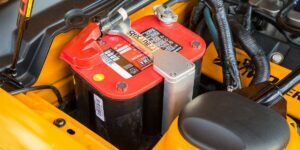 It is an affordable mid-sized car battery that is definitely an option for a wide range of applications. Long-life battery compared to others. Can be difficult to fit in some cars. 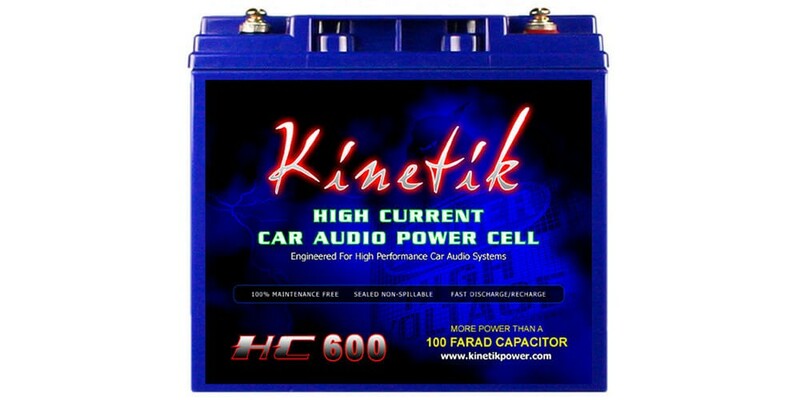 The HC600 is a high current power cell specifically engineered to power audio systems up to 600W. Because of this, it is an excellent choice for people on a budget. Don’t think because the power cell is cheap that it doesn’t perform. This battery saves your vehicle’s battery while simultaneously enhancing the audio system. The cell is sealed with AGM technology and designed to withstand extreme heat. The fact that it can also tolerate intense vibrations also make it a suitable replacement for your car’s normal battery. With the Kinetik’s non-spill design and the battery’s durable construction, you can mount this cell in any position without any problems. It has a super low ESR, tightly packed cells for higher voltage under load conditions, plus more plates for superior energy density. 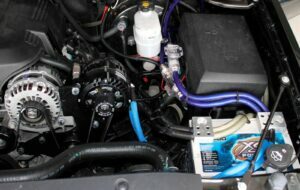 All this makes the power cell the best battery for car audio system if you have a modestly sized system. Ideal for a modest system of up to 600W. High-performance battery with durable construction. Can be mount in any position with its non-leak design and AGM technology. Cannot be used for high powered systems. To replace your current battery, you will need to purchase additional equipment. The battery is completely sealed to prevent any hazardous leaks, making it one of the most reliable units on the market. In every other aspect, the Stinger SPV69C is a mid-range battery. It is designed for moderate to high-performance sound systems and has a price to match that. 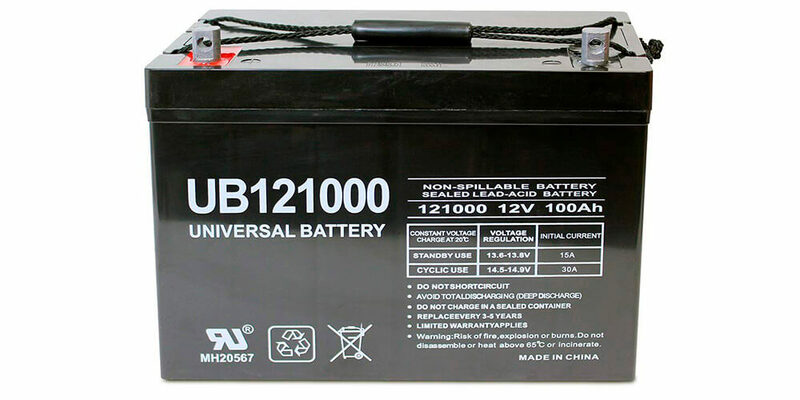 This is a car battery for sound system of up to 1320W, even though it is rated to produce up to 2000W. It is rated at 660 cranking Amps and able to do over 300 discharge cycles. This enables it to store energy and eliminate the need for a capacitor in your system. The SPV69C has removable brass battery posts which, coupled with the AGM design, allow installation in any factory battery positions. Also, if you have ring-shaped terminals, you don’t have to worry since the battery accepts ring terminals. 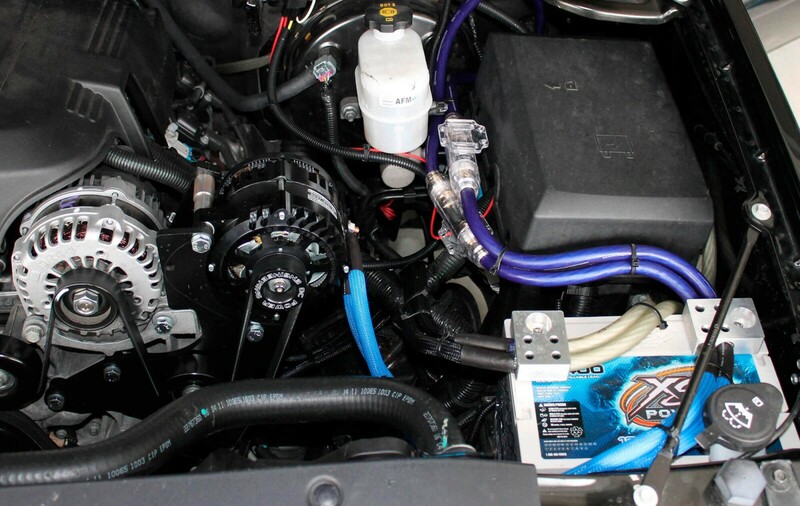 Lastly, the battery can be used as an auxiliary or a replacement for your standard car battery. Mountable in any position without worry of spills. Over 300 full discharge cycles. No need for a capacitor in your system. Cannot work with high powered audio systems. This is engineered for high-performance. The battery has ultra-low ESR and more plates for a stronger energy density. It uses absorbed glass mat (AGM) technology and a leak-proof design that makes it a small yet powerful battery. All these features make the cell high-performance and mountable in any factory battery location. With 600 cranking amps and an 18-amp hour rating, the HC600-BLU is potentially the best battery for car audio under 600W. But the nice thing is that this is a 2 pack and you get two batteries, not just one. The super durable housing that has no external vents ensures the battery can be mounted without any hazardous leaks. Making Kinetik’s battery maintenance free. This housing is a reinforced ABS plastic case that is capable of withstanding intense heat and vigorous vibrations. 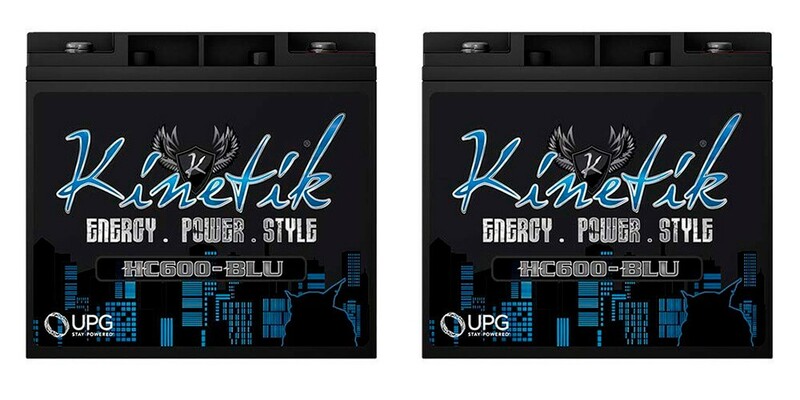 These features mean that you can essentially replace your original equipment manufacturer battery with the Kinetik battery. The only downside is one of these cannot be used with high-powered stereo sound systems, despite the pack coming with two batteries. Works best with systems under 600W. Mountable in any position with no leaks. If you have space, you can use both batteries to power a moderately sized sound system. To use it as the primary battery, you need additional equipment. Need space to fit both batteries. First thing is to measure the battery and understand the dimensions of it. Then check if your vehicle has enough space to house it. If it can’t fit in the engine compartment, then it can go in the trunk, passenger compartment or underneath a seat even. However, since batteries can explode, the battery needs to be in a sturdy water-tight box if it is going anywhere outside of the engine. Of course, the battery must be as close as possible to the amplifier. Plus, a stiffening cap should also be close to your amplifier. If you are installing the audio system for competitions, then I recommend matching your existing battery to the auxiliary. The two should be the same age, group, and brand. Competition judges will make note of that. If instead you just want a sick system then you don’t have to match the batteries unless you want to. The secondary battery should be wired parallel to the original battery. The thickest gauge battery cables, of reasonable size, should be used to connect the power cell. To know how many watts is good for your car stereo, you first need to determine the wattage of the audio system. If you know your system is 1500 watts, then you get a battery that can meet that power rating.